IBASSIN: 2019 FLW Tour Lake Toho Day 2: John Cox Retains Lead with 48-13lbs! Cox’s strategy for Saturday is to change up everything. He’s been saving a secondary area with different water clarity, located a long way from where he’s fished the last two days, where he can use entirely different tactics in what is forecast to be a vastly different day of weather. Cox says the wind and clouds in the forecast are perfect for what he wants to do, and the conditions overall the last few days should be setting up this particular spot to turn on tomorrow. It’s not totally un-Cox-like for him to scrap everything and do something off the wall, and the move makes sense. It’s a place he’s caught fish before, and most of his action has come after 1 p.m. Cox could always come back and try to replicate what he’s done the last two afternoons if Plan B doesn’t work out. Fate, instinct, luck – something is working in Aaron Britt’s favor this week at Lake Toho. On day one, Britt planned to run down to Kissimmee to bounce around some areas he found in practice. While waiting for the lock, he pulled up on a spot in Toho and hammered them so well that he wound up staying for about four hours. He eventually went to Kissimmee, came back and culled a few fish on the spot again. His day-one catch of 21 pounds, 2 ounces included a fish that weighed nearly 8 1/2 pounds. Today, Britt caught a 4-pounder and two squeakers on that spot in the morning and nearly pulled the plug to go back to Kissimmee. Britt added 24 pounds, 2 ounces to his catch today for a two-day total of 45-4. He says he’s sharing his water with a few pros, but the only other one who was really dialed in like him was Larry Nixon, who missed the cut. It’s an offshore spot with a mix of grasses requiring very precise casts. Britt is using both moving baits and some slower presentations with plastics. Should the Toho spot not pan out for Britt, he does have Kissimmee as a back-up plan. We’ll find out on FLW Live tomorrow whether or not Britt needs those Kissimmee fish, but it sure seems like he’s found the magic spot. He’s only caught 19 fish from it in two days, meaning there’s probably some more to be had – if not more coming. Maybe enough to get Britt his first FLW Tour victory. Braxton Setzer is optimistic about his chances of bringing in another quality catch on Saturday because his best area is steadily reloading. He’s weighed in limits of 19-7 and 23-5. Setzer has been fishing as slow as possible the last two days. The one exception was a brief period this afternoon when the wind picked up and created a ripple on the surface. He was able to finally get bit with a moving bait. Tomorrow’s forecast is for more wind, giving Setzer some hope that he might be able to pick up his pace and close the gap behind Cox. Yesterday, Scott Martin got into the hunt on Lake Toho. Today, he scrapped everything and ran to Kissimmee to catch 17-15. The small fish in Martin’s best waters at Kissimmee weigh a healthy 2 1/2 to 3 pounds. He’s not struggling to catch five of those as a solid base. As long as he can keep finding a big kicker or two each day, Martin thinks Kissimmee is his ticket to the top 10. Also, on Kissimmee, Martin is fishing off the bank, and he’s using moving baits. That plays perfectly with the weekend forecast. 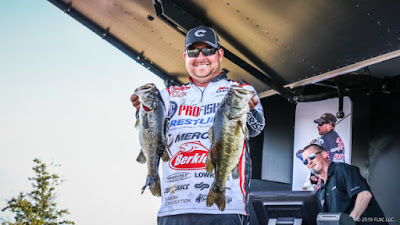 Buddy Gross is also fishing off the bank and has now hauled in back-to-back 20-plus limits despite failing to get one of the really big bites that he enjoyed on a daily basis during practice. “There’s some prespawn and postspawn fish,” he says. “I think there’s a bunch there. Flip-floppingIt’s been an up-and-down tournament for many pros. Of the nine pros who caught more than 20 pounds on day one, only two reached the milestone again today. Nine pros who did not catch 20 on day one managed to do so today. Rex Huff was the biggest flip-flopper, going from 2-12 to 21-1. Jim Jones dropped from 19-10 to 2-15. You can scan the results to see several others who went from single-digit weights to mid-teens, and vice versa. You can blame most of the changes on the fickle nature of spawning Florida-strain bass and the fact that no one really seems to understand where these fish are headed right now. Jay Kendrick caught all his fish this week on a topwater bait. Unfortunately, a two-day weight of 28-5 wasn’t enough to make the cut. Losing some key fish might’ve cost him, but Kendrick wasn’t too down on himself about it. Maybe he just needed some different “tackle” anyway. “I was fishing some really heavy pads today, and, man, you about gotta have a goat rope and chains to get them out of there,” he joked. Catching only 9-14 on day one didn’t keep Jamie Horton out of the cut. The Alabama pro caught 25-8 today to vault into 11th place. Most of his limit weight today came in the form of a pair of giants Horton plucked off beds. One weighed 9 pounds, and the other was a 10-pound, 5-ounce bruiser that’s the second biggest bass of the tournament behind the 10-9 John Cox caught the first day. “I don’t make but, like, one Instagram post a month, but I made sure to make one today,” Horton joked on stage. Casey Scanlon also made a big move today, adding 28 pounds (the day’s biggest limit) to 12-10 from the first day. He’s in seventh place. Scanlon is very confident in what’s found. He’s blind-fishing for spawning fish, and although he’s sharing water with others who made the cut, Scanlon says he has a couple little spots to himself. More importantly, the fish – big ones – are replenishing. Today, his limit included a 10-4 and a bass that was probably around 8 pounds. He also dumped a near-8-pounder. Yesterday, Scanlon might’ve done a lot better, but he lost a couple good ones then, too. He says he was fishing with braid, and he thinks the lack of stretch in his line was causing the hook to puncture too big of a hole on the hookset. Using fluorocarbon today, he had much better results on the real giants.